In most schools, children are taught a sound for each letter, plus other common spellings such as "sh", "th", "ch", "ay", "ee" and "ow". However, few schools seem to systematically work their way through most of the 300 or so patterns that exist in English spelling. This leaves a lot of learners really struggling with spelling, particularly with the three main things that make English spelling hard: hearing all the consonant sounds in blends and clusters; learning all the spelling choices and overlaps; and managing the unstressed vowel. If they're not taught useful strategies, many learners develop their own less-than-helpful strategies, head off down the wrong path, lose their confidence and end up deciding they don't care about spelling well anyway. The spelling system is a big, complex information system, thanks to the number of times England was invaded while the language was forming (the Romans, the Angles, Saxons and Jutes, the Danes, the Normans), the cultural/religious/historical importance of Latin and Greek, and then the British Empire and globalization pinching words, and their associated spellings, from everywhere. My morning “coffee” is a word that came into English from Arabic via Turkish, the “sushi” I’ll have for lunch is obviously from Japan, and the “dhal” (sometimes spelt “dal”, “daal” or “dahl”) I’ll have for dinner is a Hindi word, not to be confused with Roald Dahl, Welsh novelist, whose name is originally Germanic (like “Stahl” and “Stohl”, though the “hl” in “kohl” is from Arabic). The trick to learning any big, complex information system is to organise it well. We can let children do this, but there’s a fair chance that they will do the same sort of job they’d do if you gave them all their furniture and possessions and told them to go away and independently organise their room. Chances are you’d end up with all the blue things in the wardrobe, all the green things under the bed and most other things scattered across the floor while they try to cram all the yellow things in the sock drawer. To prevent chaos and confusion, adults provide children with upfront systems for organising their rooms. We demonstrate the use of helpful categories like “socks”, “undies” and “toys”. 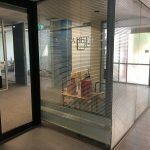 A little negotiation is often required, and the system tends to be maintained with fairly moderate success and occasional outbreaks of chaos, but it’s a whole lot better than just leaving them to it. The same applies to spelling. 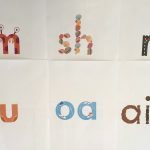 Adults should provide children with the superstructure for storing and recalling the relationships between sounds and letters, both common patterns and unusual spellings. Kids can then fill this superstructure up with the words they know. Kids love collecting things, so if you provide a really good superstructure they can go on a treasure hunt and bring back words you hadn’t even considered for each category, like the name of a local cafe, a town they went to on the weekend, or their cousin’s best friend. 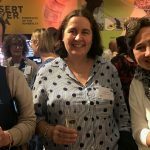 You don't need to be a rocket surgeon to work your way through the English spelling system – you just start at the short, simple, well-known end and then work your way towards the long, complex, less-known end. There’s no single, correct way to do it. My system, if you want to use it, is here. 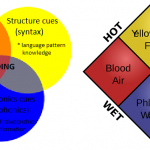 Two and three-sound words: Start off with one-syllable words without consonant blends or clusters, and “checked” vowels – vowels that require a consonant after them, so “a” as in cat, “e” as in bed, “i” as in win, “o” as in got, “u” as in pup, and perhaps also "u" as in put. Teach all the main spellings for all the consonant sounds including the ones that don't have their own letters – "sh", "ch", "th" and "ng" (but not “zh” as in beige, treasure and vision, which is pretty rare and occurs mostly in two-syllable words). Make sure you teach the ending spellings "ck", "ff", "ss", "zz", "ll", "tch" and "dge", as too often phonics programs forget about them, and just focus on beginning sounds/spellings. Consonant blends: Next you can introduce either more vowel spellings, like the “ay” in day and the “er” in her, or consonant blends and clusters like the “p+r” in pram and the “ng+th+s in strengths. I prefer to work on blends and clusters first, because you get a huge number of extra words without too many new spellings – just "qu" instead of "kw", "x" as well as "cks", past tense "ed" and associated double letters, "n" as in "ink". Stick strictly to one-syllable words. Once learners can manage them, you put these blends and clusters with additional vowels to make stacks more words again. Vowel spellings: Still focussing on one-syllable words, work your way through the spellings of 19 vowel sounds – all but the unstressed vowel (see below). Include common spellings like the “a…e” in came, the “ai” in rain and the “ay” in pay, less common ones like the “eigh” in eight, the “ei” in vein, the “ey” in they, and funny spellings in words learners know, like the “ea” in great, the “e…e” in fete, the “aigh” in straight, the “au” in gauge and the “ao” in gaol (which most Aussie learners meet on educational trips or when studying Ned Kelly). 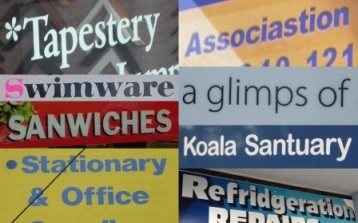 Shared spellings: Observe that many vowel sounds share a spelling, for example the spelling "ea" usually sounds as it does in bean, cheat, dream, feat, leap, sea and tea, but there is a sizeable bunch of words like bread, death, head, meant, sweat and thread, and a handful like break, great, steak, Seamus, Yeats, Yea and Ronnie Reagan. There are also usually a couple of words with unusual sounds for each spelling, like the "ea" in bream and Sean. Some written words have more than one pronunciation, so you don't know which to say until you know the meaning/context e.g. "I'm going to read it" v/s "I've read it". So while this is a fairly complex, overlapping system, the main patterns are strong, and once you've internalised them, the funny spellings become obvious and memorable too. Two-syllable words: Start work on two-syllable words, and don't skimp on practice managing the unstressed vowel, which is the hardest part of spelling long words. This spoken vowel can be represented by pretty much any vowel spelling – it’s the “a” in sofa, “e” in event, “er” in super, “re” in metre, “r” in fire, “ar” in liar, “or” in tractor, “our” in odour, “ou” in jealous, “ure” in nature, “ah” in mynah, “o” in violent, “i” in pencil, “u” in cherub, “a…e” in delicate, “i…e” in granite, “o…e” in purpose, “u…e” in minute, “au” in restaurant, “ae” in aesthetic, “y” in martyr, “ie” in mischievous, “ough” in thorough, “ai” in portrait, “ei” in foreign, “ier” in papier-mache, “oar” in cupboard, “ur” in sulphur, “oi” in porpoise, “ui” in circuit, “ir” in tapir, and I could go on but you’re probably bored now, and get my point. The trick to managing the unstressed vowel when spelling is to say each word as it is spelt. Luckily, because your learners know a lot about vowel spellings from the previous two steps, they are equipped to do this. 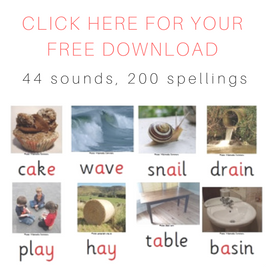 Harder spellings and longer words: Introduce additional spellings used in multi-syllable words in a systematic way, either by working through my list, someone else's, a commercial synthetic phonics program, or a list of your own devising. The important thing is to have a system for demonstrating and practicing spellings like the “tt” in “butter” the “le” in cattle, the “y” in gym, the “gh” in ghost and cough, the “au” in fault and the “et” in ballet, and all the rest. There are about three hundred patterns, depending on how thin you slice them. 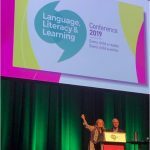 This will ultimately equip learners with the tools they need to confidently remember and tackle even words like “antidisestablishmentarianism” and “supercalifragilisticexpialidocious”. 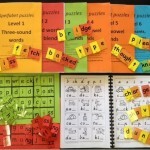 This entry was posted in curricula, phonics activities, sound-letter links, teaching strategies on May 17, 2012 by alison.